If theres one thing I need to start doing more in my life, it’s taking more photos. I know, thats strange for a blogger to say but its true; I’m great at taking photos for my blog, but I hardly ever take photos of my day to day life. If I go out for a meal with Chris or off on a road trip with a friend, I tend to just live in the moment and enjoy myself. It’s only after than I think that perhaps I should have taken some photos of the day (not just to post on social media to prove that I actually do have a social life!) but to look back on fondly when I’m feeling down and depressed. Kind of like a happy jar on my phone. But recently I’ve come to realise there’s another, more important reason to take photos; because eventually the people in them won’t be with us any more. As some of you may know, my nan was recently diagnosed with Lew Body Dementia and coming to terms with this hasn’t been easy for me. Even just writing about it is difficult (I’ve re-written this sentence 8 times already) and I still don’t think I’ve fully accepted what its going to mean for our families future. Some days she’s her old self again: funny, sarcastic and very quick witted. Other days she keeps telling us she wants to go home even when she is home (with her being unable to walk anymore, we had to have a special bed added to the living room so she can sleep downstairs and I think thats what’s throwing her) and will get very aggressive and argumentative with everyone. Last week she was refusing to go to the toilet because she thought it was still outside (like when she was younger) and nothing any of us could say could convince her otherwise. I think the carers eventually managed to “trick” her onto the commode but it was really upsetting to see and I had to go home before she saw me crying and got even more upset and confused. And the thing is, it’s only going to get worse. Eventually she might not ever know who I am. Thats something I really can’t think about at the moment without getting very upset and I don’t think bursting into tears on a crowded train is a good look; even if it is 9:30am on a Monday morning. But if there’s one thing I’ve learnt from whats happened, it’s to make memories with the ones I love while I can and to take as many photos as possible too. I love showing nan photos of the day trips we went on when I was little, it brings a sparkle to her eyes and you can see she does actually remember them. It also helps me remember what she was like before the Dementia started, which in all honesty, I’m finding harder and harder to do recently. The only problem with a digital photo collection is that its hard to find the photos you want, when you want them. If you’re anything like me your camera roll will mostly be a collection of random screenshots (which you’ve absolutely no idea why you took) and photos of outfits or tattoos you like that you’ve saved from Pinterest. Sifting through all of these to get to a photo you took two years ago isn’t going to be easy! Which I why I’ve fallen in love with printing my photos out. Luckily it’s a little bit easier these days! I collaborated with Printiki last month to get some of my favourite pictures printed off and it was so much easier. You simply pick which style you want, upload the photos you want to be printed and then reposition them so you get everything you want in the frame (no more pictures of your grandad with only half his arm in the shot!). Then all you have to do is sit back and wait for them to be delivered to you. That bit still hasn’t changed and I’m still just as impatient as I was 20 years ago. I went for a retro polaroid look but there are lots of different ones you can choose from and you can ever add text if you want to. Not really necessary for me, unless its to shout I PASSED! on the photo of me passing my driving test, which I still can’t believe some days. But it could be a great feature if you’re giving the photos as a gift and want to make them more personal. I’m thinking of making a few of their photo books next and theming them around certain events. One full of baby photos. Another of my favourite photos with my parents. Mine and Chris’s first year together… I could easily fill a shelf with them! I’ve kept the photos next to my bed so that whenever I’m feeling down or like I’ll never achieve anything, I can look through them and see all the things I’ve achieved. Passing my driving test, going to uni, day trips with friends. I can also use them to remember some of the best events in my life like finally going to see Status Quo with my parents and jumping around like idiots when they played Rockin’ All Over The World. That one never fails to make me laugh. So my goal for this year is to take as many photos as I can and get them printed out; either singularly or as part of a photo book. I’m also going to take them round and show my nan, so she can see what I’ve been doing and the places I’ve been going, rather than just listening to me talk about them. I read somewhere that showing people picture of past and current events can help, as its something they can physically see and it can trigger their memories. Maybe it will help her, maybe it won’t, but at the end of the day; theres no harm in trying. Get access to the exclusive free resource library of eBooks, checklists, presets and more! 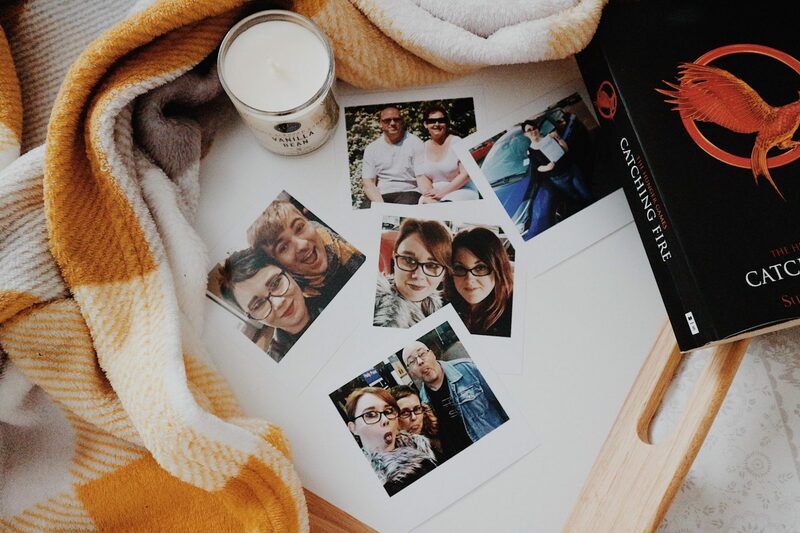 "5 Little Ways You Can Practice Self Care Every Day"
What an amazing heartfelt post ❤️ I’m guilty of not taking as many photos as I should and I genuinely can’t remember the last time I printed a photo. When my older girls were small I printed off photos and made up albums for them but my son only has one pretty small album of photos- I must rectify this! This post really touched me. I’m sorry about your nan and I’m proud of you that you’re trying to help in whatever way possible. I agree we need to take more photos and especially have them printed out like the old days. I have 3000+ photos on my phone that I seriously need to sort out! This is such a positive message of why we should take more photos. In this day and age, many people say we take too many photos but what they forget now is that a photo can hold such precious memories! I’ve never understood the people who have a go at people for taking photos- why wouldn’t you now the technology is so readily available! Hopefully posts like this can show people the positives of taking photographs! I love this post because I’m so tired of hearing people say that we need to stop taking photos and get our phones out of our faces and live in the moment. Living in the moment is good and all, but I like to be able to look back on it. This is a beautiful post. I am so sorry for what your family is going through but the sentiment and emotion in the post really speaks to me. I think I need to start taking more photos too. Thank you so much hun! 💛 I honestly believe now that you can never have too many pictures, especially printed ones. I strongly agree with this post and share the same sentiments. Whenever I am in a setting with good people and good vibes I tend to forget all about the pics and try to live in the moment and whenever I leave I always regret not capturing those moments. I am thinking about going on a short vacation soon and I am thinking about fun pictures I can take with my boyfriend and I so we can look back at it in the future and smile. I hope you managed to take lots of photos and enjoy your vacation hun ☺️ someone came up with the suggestion of getting a disposable or Polaroid camera and using that, which I quite like! I agree with you about taking pictures more often! I feel like we can destress by looking at pictures (oooh those memories!). I’m happy to hear that you’ve printed your pictures! With the digital age, I was getting worried that people are leaving everything on their devices, which can be forgotten easily. Both my grandmas are developing dementia (at different stages) and sometimes it’s hard, sometimes it’s frustrating when you have to be repeating the same conversations every week but I find it’s just about being there in that moment! I also have a bullet Journal so I’ve been trying to take more photos to include in there as well! You are so right- think it’s so important and it’s such a lovely way to preserve memories -I make each of my kids an album every year on their birthday and a family one too – and they now love sitting with their albums and see themselves when they were babies. Some of the people in the pictures like my grandmother are no longer with us, but they see her pictures and remember her and it’s lovely. I’m so sorry to hear about your nan, but you put such a positive message on a topic like this. I think it’s great you want to take photos every day of memories for her. We should all do that! Of course it’s important to live in the moment when it comes to making memories, but to at least have one photo from that day, that’s the best memory in the world. This was a wonderful post to read. So sorry about your nan lovely! This is such a good idea though, when my Grandad passed away last year it made me realise how important taking photos is! He hated having his photo took and there are hardly any photos of us together which breaks my heart, he was like my bestfriend and I’d love to have more photos of us together to look back on and show my future children! I think your photobook idea is great and I’m sure your nan will love to see all the photos of your adventures! This was such a beautifully written post Jade, I’m so sorry to hear you lost someone close to you. I love this! It’s so important to keep memories and to always take photos. I love getting my photos printed out too – it’s nice to flip through them instead of going through them on my phone! Okay first of all, I am so so sorry to hear about your nan and sending all my love and wishes for lots of good days and memories to come yet! 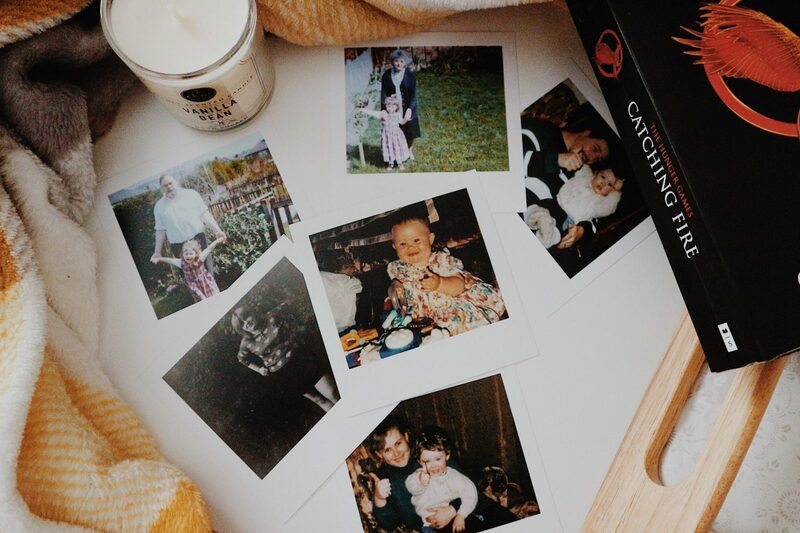 Photos are so important for remembering small details and events aswell as bigger ones and making a little book of them is the sweetest and loveliest idea. It’s so much nicer to have them physical and able to hold and keep too rather than just shoved on a phone or camera! I take TONS of pictures! I’m the one in the family who takes all the holiday pics & etc., but I’m horrible about not printing them out!!!! I definitely need to get better at that! I love looking back at some of our old family albums & seeing the photos in print. I’m so sorry to hear about your Nan’s diagnosis! It’s such a blunt way to remind yourself that people don’t last forever. It’s something I’ve only really realised recently, too, and it’s definitely inspired me to start taking and printing out more photos. I’ve recently printed a bunch of photos of my family and friends with the aim of hanging them up once I redo my room because memories were made to be cherished. I’m so guilty of not taking enough photos, though, so that’s definitely something I want to change in the future! I’m sorry for your Nans sickness. I found that old photos really help bring them back for a little bit. My grandfather has Demetia and can’t remember what happened five minutes ago but bring out some old pics and he can talk for hours!! Will check out the site you mentioned too as that sounds very cool! Thanks for stopping by! I’m a twenty-five-year-old digital media graduate with a passion for writing and a desire to change the way we view mental health and autism. I’ve owned jademarie.co.uk for nearly two years now, and its slowly changed from a place where I would brain dump whatever was going through my head that day, into a place where people can come for help, advice and hopefully a bit of a laugh. I do occasionally come out with a witty sentence or two. Mostly by accident. struggling to get views, subscribers or sales? Sign up to my exclusive free resource library!